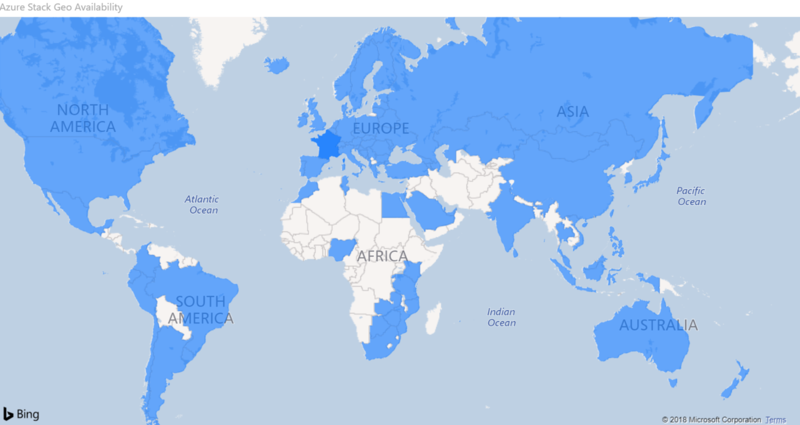 Earlier today, we announced some exciting updates across Azure IaaS, including that we will expand the footprint of Microsoft Azure Stack to a total of 92 countries/regions. On my first week as the new Azure Stack marketing leader, I am incredibly proud of the great work that has been done by the Azure Stack team and our hardware partners to make this happen. I am very excited about this investment and effort to meet our growing customer interest and demand for a true hybrid cloud. We are seeing amazing use cases envisioned by our customers, and solutions built by our partners that leverage Azure and Azure Stack together, such as Intelligent Edge scenarios, DevOps, or solutions that meet policy requirements. At Ignite last year, we launched Azure Stack in 46 countries/regions, and given customer demand since then, we worked with our hardware partners to double the number of countries/regions Azure Stack now supports. Since launch, we have heard some great stories from our customers and partners on how they are using Azure Stack, and the value they see Azure and Azure Stack bring to their business and IT environments in true distributed and hybrid environments. For example, Azure Stack empowers Romania’s BinBox, a leading telecom service provider, to stand out in an extremely competitive market by expanding their services. “The inclusion of Microsoft Azure Stack services into our portfolio enhances our value proposition in a number of ways, from DevOps tools, a truly hybrid cloud offering, access for customers to Azure services like Business Intelligence and AI, to a fully managed service for any customer who wants it. Microsoft Azure Stack will bring us customers who wanted to exploit public cloud but were holding back due to data location concerns. In fact, our pipeline already includes about 60 customers we couldn’t have targeted pre-Azure Stack,” said Tiberiu Croitoru, CEO of BinBox. Additionally, we have been collaborating with our ecosystem partners to help customers navigate their business needs. Read on to hear from our partners about their excitement for Azure Stack. “As a joint venture between Accenture and Microsoft, Avanade provides Azure Stack as a fully managed service, so customers can focus on their business. We are excited to work with Microsoft to expand our coverage to a broader part of the world,” said Rich Stern, Executive, Global Market Units and Cloud, Avanade. “The Cisco Unified Computing System has a global footprint with over 60,000 worldwide customers and is a leader with service providers globally. Partnering with Microsoft, and leveraging leading Nexus-based networking capabilities, we have installed Azure Stack in a wide range of customer locations in EMEA (for example Binbox), North America and Asia-Pacific. We are delighted that the Cisco Integrated System for Microsoft Azure Stack is now available for an expanded audience who need the benefits of hybrid cloud solutions deployed with Microsoft Azure Stack,” said Mary Perisic, Global Alliance Manager, Cisco Systems, Inc.
“Enterprises across the world are demanding a complete hybrid solution to meet their growing and ever-evolving business needs. With the latest HPE ProLiant for Microsoft Azure Stack (Gen 10) solution, we enable customers across the globe to simplify IT implementation and reap the benefits associated with cloud operating models, delivered on-premises,” said McLeod Glass, vice president and general manager, Software-Defined and Hyperconverged Solutions, HPE. “At Lenovo, we are committed to solutions that focus on performance. As Microsoft continues to expand the availability of Azure Stack across the globe, we will continue to support this with our unique, industry-leading ThinkAgile SX products and services in many of those regions,” said Per Overgaard, Executive Director, Business Unit, Lenovo Data Center Group, EMEA. “Customers will experience the simplicity of Azure Public Cloud and the reliability of Lenovo's ThinkAgile SX for Microsoft Azure Stack. A few weeks ago, Natalia Mackevicius shared a recap of what we announced at Microsoft Build 2018 for Azure Stack developer features and the innovation we had over the last 6 months. Looking ahead, I am super excited about the opportunity we have with Azure Stack and how it complements Azure by bringing new hybrid cloud scenarios to our customers, and empowering them to realize business value much faster than before. Finally, for our partners, we hope to see you at Microsoft Inspire 2018 where we will share how our ecosystem partners can take advantage of the Microsoft Hybrid Cloud Opportunity! For a full list of countries/regions where Azure Stack is available, please visit the Azure Stack webpage. To learn more, see a list of countries/regions supported by our partners, and click on your preferred partner’s logo.